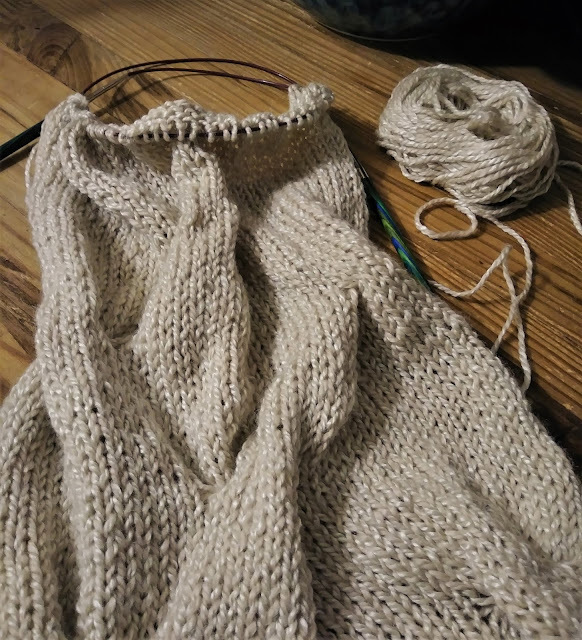 What's on my needles these days? I'm currently knitting a third Burberry cowl. I just love this pattern. And the yarn! 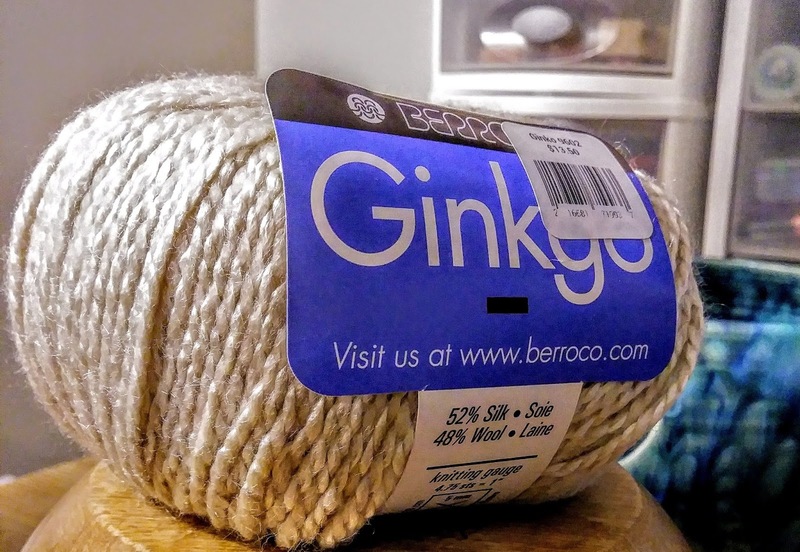 The yarn is a 52% silk, 48% wool blend and glides through my fingers like butter. And, my daughter, who is THE most whiny person on earth when it comes to wool on her skin, loves the navy one she received for Christmas and wears it frequently. Wears it frequently, against her skin, without complaint. It's That soft and itch-less! So far, this Burberry is well traveled. I've taken it to three knitting group meetings and to the coffee shop twice with the intent of photographing it in a more interesting setting.... And each time I've been so happy knitting on it, I've forgotten to take the photo. Thus, you're stuck looking at another boring photo of my knitting spread out on my desk in bad lighting. Sorry. Open windows in February = Joy! Besides the joy of knitting another Burberry cowl, I've been enjoying the recent weather. Look closely at that photo. (Look closely but ignore the poor dying plant.) The window is open! We've even been sleeping with the windows open. Like, open open, not just barely cracked open. That will change tonight though. Our temperatures are going to drop steadily today and by tonight we'll be back to our normal icy February weather. The warm spell was a joy while it lasted, but I have to admit - I'm not ready for winter to be over yet. And speaking of my poor dying plant - thank goodness for the warm enough to open the window weather! 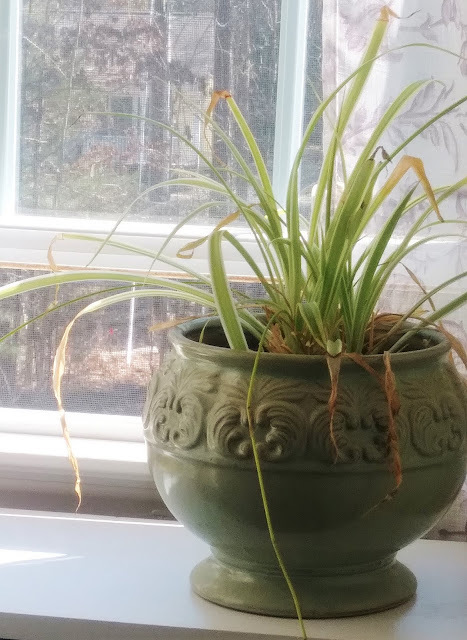 While opening the window, I noticed my plant's unhappiness. Somehow, I must have watered it and another one nearby twice and skipped watering the other two that are on the other side of the window. Two of the plants had almost an inch of standing water in them (as in, standing on top of the dirt!) while the other two were bone dry. Can you say Alzheimer's??? Yikes! I had bedroom windows open this week too! And the sliding door to our patio. The warmth felt so nice, but like you I am not quite ready to let Winter go. It's only February! That silk/wool blend sound so nice and what a great pattern for the cowl. Well, we know which plants you like the best! love your knitting and I've been on a cowl kick, I like the way they wear around my neck.